The Game Developers Conference (GDC) is an important industry event that blends the art of game design with the business of getting those games published, and also a place where new technologies and game development tools are unveiled to the development community. 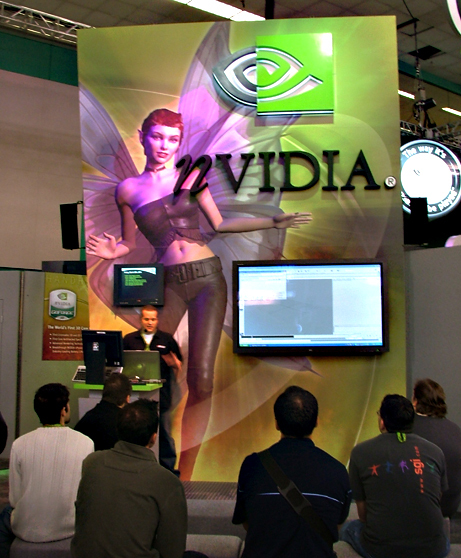 We have put up below some coverage pictures of the GDC with pictures from various IHV stands : XGI, nVidia, ATI, S3 Graphics, AMD, Intel, Nokia and Sony. We have posted yesterday some coverage pictures of XGI’s booth over at CeBIT on Day 1. Today we will look more closely at the boards from XGI’s AIC partners present at CeBIT: Abit, Chaintech, Amigo Image and Club3D. ABIT has a whole new lineup based on the XGI Volari series : the Volari Duo V8 Ultra, the Volari V8 Ultra and the Volari V8. CeBIT ranks as the world’s number one event for the ICT sector. It is the only trade fair where representatives of business, science, politics and media can see all the latest trends in a single location. XGI is conducting meetings with worldwide buyers at CeBIT and is currently exhibiting the latest Volari™ family graphics solutions to global end-users at Hall 23, Booth C33.